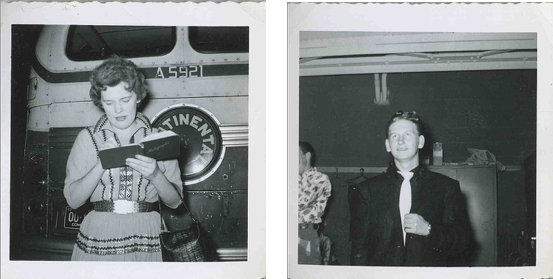 The Photos of George Kealiher, JR.
Kealiher spent his youth working at the Rainbow Ballroom near 5th & Lincoln in Denver, one of the best known dance halls west of the Mississippi from its opening in 1933 to its closing in 1961. 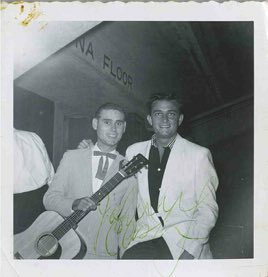 His relationship with the Rainbow management allowed him—and his camera—backstage when they booked national acts at the newly constructed Denver Coliseum, which started operation in 1952. Before passing away in January 2016, Kealiher bequeathed a shoebox filled with photos to his volunteer caregivers, John and Lisa Ferreira, who donated the collection of snapshots to the Colorado Music Hall of Fame. Spearheaded by a young Elvis Presley, country music transitioned to rockabilly between 1956 and 1958. National acts booked into the Denver Coliseum mirrored this trend, as performers from the Louisiana Hayride, the Grand Ole Opry and Ozark Jubilee showcased their talents in the Mile High City. Among them, as represented in the exhibit: Patsy Cline, Roy Orbison, George Jones, Faron Young, Wanda Jackson, Don Gibson, Ernest Tubb, Minnie Pearl, Lefty Frizzell, Cowboy Copas, Hawkshaw Hawkins, Ray Price, Kitty Wells, Porter Wagoner, Little Jimmy Dickens, the Louvin Brothers and a young Johnny Cash before he became the Man in Black.